Part tool box, part organizer, all Wolfgang! The Wolfgang Detailer's Bag is a carry-all for your detailing supplies, even your polisher! Just like a carpenter's tool box, the Wolfgang Detailer's Bag carries your tools of the trade. This well-made, generously sized bag holds bottles, buffing pads, brushes, and everything else you need to tackle any detailing job. This bag reminds me of the old-fashioned doctor's bag. It's perfect for a mobile detailer making house calls. With 12 pockets, two large compartments, hook and loop fasteners, and interior elastic straps for small items, the Wolfgang Detailer's Bag literally has a place for everything. At 17 inches long, the Wolfgang Detailer's Bag accommodates the Porter Cable 7424XP and most other polishers. It has a bottom compartment for pads and backing plates. You can fit 10 16 oz. bottles, two 8 oz. bottles in two smaller pockets, multiple detailing brushes and swabs, towels, and there are even hook and loop fasteners on the top of the bag to secure an extra extension cord. Whew! That's a lot of detailing supplies but the Wolfgang Detailer's Bag can handle it. The Wolfgang Detailer's Bag has multiple exterior pockets for products and tools. In the underneath pocket, you have tons of room for foam pads and microfiber towels! Load it up! The rugged construction of the Wolfgang Detailer's Bag means you can fill it full of products without putting any strain on the materials. The stainless steel handle is secured into the hard end panels that give the bag its shape and strength. The entire bag is made of rugged, water resistant, 600 denier nylon canvas. The seams are all reinforced with canvas and metal studs. The bottom of the bag features two non-skid feet. 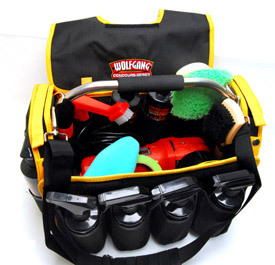 The Wolfgang Detailer's Bag is a must-have for any detailer or hobbyist. The bag is big, its functional, its organized, and it looks great. The black bag has yellow trim with the Wolfgang Concours Series logo embroidered on the top flap. 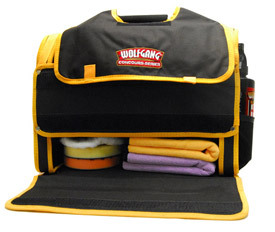 Polishes, towels, a buffer, and pads are the tools of your trade and the Wolfgang Detailer's Bag is your tool box. Wolfgang Detailer's Bag is easily carried by the included strap for increased mobility! I like the bag, It holds quite a bit of stuff, more than most average bags. It has plenty of space and some hidden compartments for towels and things. 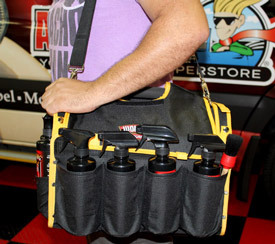 It is the tool bag of auto detailing. strap compartments ok for pints quantities, no quarts like the amount of working material/selection it can carry really like the lower comportment fits a 6" orbital tool perfect plus a selection of pads and a backing plate. This was a great value for the price. Have used it to hold all my car show cleaning and polishing material. Excellent design and pleasant to look at. It handles weight of some heavy products. I would recommend this bag for multiple uses.Very clever design . It is a piece of luggage for your prized possessions. I recommend this bag. Big enough without being too big. I needed something smaller than the Rupes bag and this one fills the bill. Space for one polisher, pads, and associated supplies. Very sturdy. Won't flop over and spill your supplies. A little too big to keep in your trunk for emergencies though.